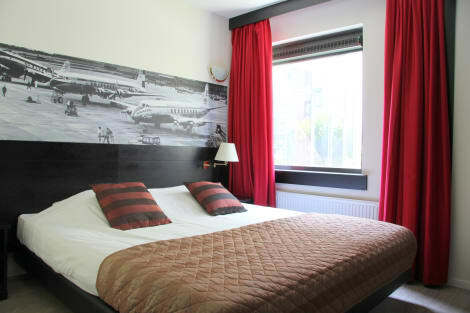 Near Amsterdam Airport and the Business Park Schiphol-Rijk, the 4-star Best Western Plus Amsterdam Airport Hotel is also close to the World Trade Centre making it a great choice if you’re catching a flight. Clean, smart rooms feature minibars, complimentary wi-fi and satellite TV for your convenience. Relax with a swim in the indoor pool or work up a sweat at the gym before moving on to the lounge bar for a quick tipple or enjoy a meal in the stylish restaurant. Whether you're catching a flight, you're here to discover Amsterdam, The Hague or Haarlem or you're on business nearby, count on Hampton by Hilton Amsterdam Airport Schiphol for a modern, comfortable base close to it all. Our Amsterdam hotel is located just five minutes from the airport and a 20 minute train ride from Amsterdam's city center.Save and get a head start on your day with Hampton's free hot breakfast served daily. Choose from our breakfast buffet, offering everything from light continental favorites to hot items, to set you up for the day. Feel free to help yourself to tea and coffee in the modern lobby, available 24-hours a day.With complimentary high-speed internet access throughout the entire hotel, it's easy to stay connected on the road. Get some work done at the ergonomic workspace in your guest room, use the free 24-hour business center, or hold a small meeting for up to 10 guests in our useful boardroom. Reinvigorate after a hectic day with a workout in our fitness center and enjoy a restful night's sleep on our signature comfy bed. If you need some advice about the best places to eat and what to see and do while you're in Amsterdam, just ask one of our friendly team members. Friendly service, clean rooms, comfortable surroundings, every time. If you're not satisfied, we don't expect you to pay. That's our commitment and your guarantee. That's 100% Hampton by Hilton™. Featured amenities include complimentary wired Internet access, a business center, and a safe deposit box at the front desk. Self parking (subject to charges) is available onsite. A modern Amsterdam airport hotel with free Wi-Fi and breakfast included Holiday Inn Express® Amsterdam – Schiphol offers its guests peaceful accommodation that is easily accessible from Amsterdam's Schiphol Airport via a free airport shuttle service running between 5:45am and midnight. For guests arriving by car, the hotel offers Park, Stay & Go packages, so you can enjoy your trip knowing your car is taken care of. 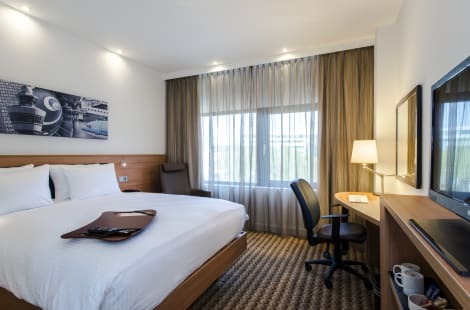 Located within the area’s business district, the hotel is within walking distance to major companies including Schneider Electric, Fluor, TNT and Joint Aviation Authorities (JAA). It is less than 15 minutes by foot to Hoofddorp train station. From here you can catch a 25-minute train into central Amsterdam, famous for its beautiful canals, and the masterpieces held in the Rijksmuseum and the Van Gogh Museum. Visit Amsterdam’s main tourist attraction Anne Frank’s House and go shopping in the lively Kalverstraat. At this hotel you can enjoy: - Free Wi-Fi - An included Express Start Breakfast buffet - A fully equipped business centre Visit our stylish lounge bar to enjoy a pre-flight drink or a quiet coffee. Feeling peckish? The bar also serves light snacks and bar bites. All our guest rooms come with black-out blinds and a pillow menu to ensure a great night's sleep, so you'll be well rested ahead of your trip. 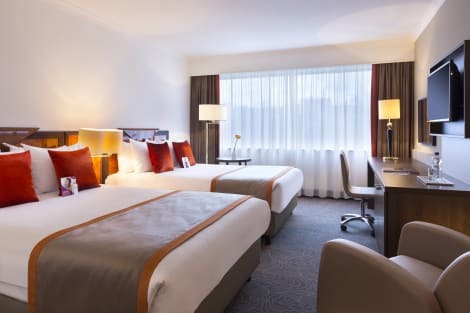 A sleek Hoofddorp hotel with upscale dining, free WiFi and airport shuttleCrowne Plaza® Amsterdam - Schiphol premium accommodations are easily accessible from Amsterdam Airport Schiphol (AMS) via our free shuttle service (email hotel for schedule/ details). It's 10 minutes by foot from the buses and trains at Hoofddorp Station, with services running directly to the airport and the city center.Business guests can host meetings for up to 450 delegates in the hotel’s 13 well-equipped conference rooms, while our Crowne Plaza Meetings Director looks after all the details. Our office shuttle can take you to nearby business districts on request. Back at the hotel, free WiFi helps you stay Completely Connected.Take a 20-minute drive to the Van Gogh Museum to see paintings, drawings and personal letters by the celebrated artist. It's only 10 minutes' walk to the many shops and restaurants of central Hoofddorp, or you can visit Keukenhof and its vibrant flower gardens, about 16 kilometers from the hotel.Unwind with colleagues and friends at the Aviator Café, where you can enjoy a meal by our award-winning chef. Relax on the outdoor terrace or in the lounge with a glass of wine, or take advantage of 24-hour in-room dining. Work out in our fully equipped fitness center and solarium. Later, enjoy a relaxing night's sleep in our spacious, comfortable rooms with premium bedding. A short drive from the airport, the excellent 3-star Bastion Hotel Schiphol offers functionality and comfort. It’s within an easy commute of Schiphol airport for business travellers, and a selection of bars and restaurants are moments away in the centre of Hoofddorp. On-site there’s a bar, cosy lounge area and restaurant. Good perks include a shuttle bus service, airport transport and free high-speed internet. 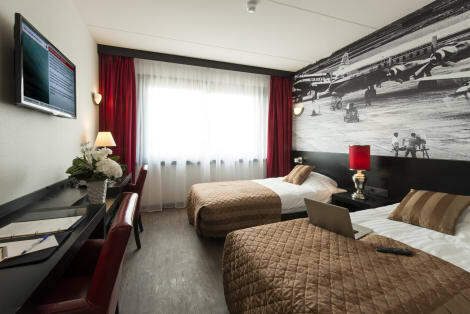 The 4-star contemporary Bastion Hotel Amsterdam Airport sits just outside the historic town of Hoofddorp and is connected to Schiphol Airport by a complimentary shuttle bus service. A great place to relax before catching a flight, the hotel has a colourful bar and restaurant, and an indoor pool and fitness centre. The Bastion Hotel Amsterdam Airport has free wifi access, and every room has air conditioning, satellite TV and a private bathroom with shower. Drop your bags at Novotel and relax. 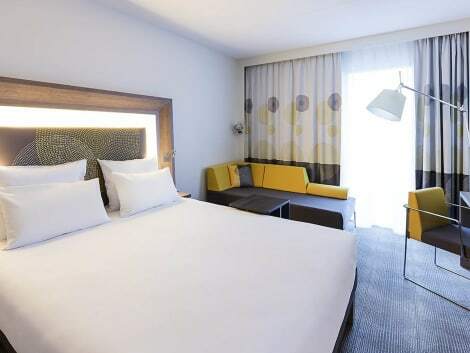 Novotel Amsterdam Airport Schiphol is a beautifully designed hotel at a very convenient location, within walking distance of Hoofddorp Station, 4 minutes by train from Amsterdam Airport Schiphol and 20 min by train from Amsterdam's city centre. 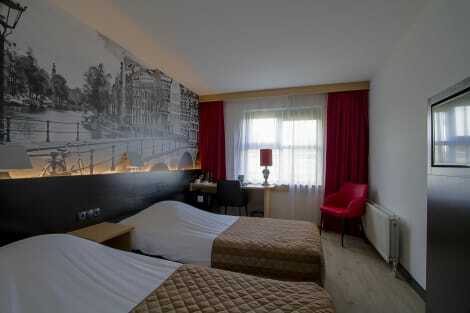 It is the perfect hotel to explore Amsterdam and the region or for organizing a meeting or congress. Discover the excellent service and first class facilities of this brand new flagship property. Take advantage of recreation opportunities including a 24-hour fitness center and bicycles to rent. This hotel also features complimentary wireless Internet access and tour/ticket assistance. Try your luck at the casino and enjoy other recreational amenities including a sauna and a fitness center. This hotel also features complimentary wireless Internet access, gift shops/newsstands, and a fireplace in the lobby. lastminute.com has a fantastic range of hotels in Hoofddorp, with everything from cheap hotels to luxurious five star accommodation available. We like to live up to our last minute name so remember you can book any one of our excellent Hoofddorp hotels up until midnight and stay the same night.